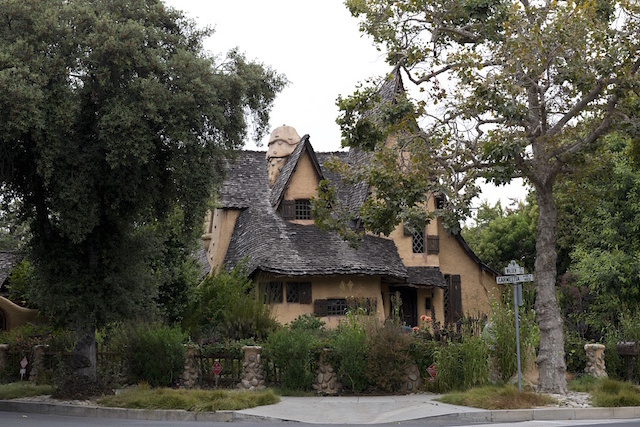 If you take a stroll through the residential Walden Drive in Beverly Hills, you&apos;ll pass by a row of upscale homes before arriving at a jarringly out-of-place "Witch&apos;s House" cottage that seems to be plucked right out of Hansel and Gretel. Also known as the Spadena House, this storybook home that was once situated on a movie studio lot and now serves as a private residence—it&apos;s unusual to say the least. Its sharply sloped rooftop evokes images of a witch&apos;s pointed hat; a moat filled with koi fish circles the front of the property; and the warped wooden shingles and lopsided shutters give off the illusion that this is a dilapidated home ripe for collapse. Even the outdoor landscaping is filled with thorny bushes, twisted plants and black dahlias. It&apos;s the perfect set for a Tim Burton film. The current owner, who resides in the house, is real estate agent Michael J. Libow—he first bought the two-story home in 1998 and has spent years meticulously customizing the interior of the house to match the creepy and whimsical exterior, making it look centuries old. It didn&apos;t always resemble a Hobbit home on the inside. "I had been showing this home and everybody wanted to tear it down," Libow told HGTV. "It had literally red shag carpets, flocked walls, cottage cheese ceilings—and I fell in love with what I could do with it." He&apos;s done a lot of work to the over 3,500-square-foot property—enough to make Walt Disney proud; the interior looks akin to something you&apos;d find in Mr. Toad&apos;s Wild Ride. Libow says that "95 to 98% is new material made to look old." The home always straddled the line between cool and kitschy. In my remodel, I wanted to keep it a bit more cool and a little less kitschy. I had been to Barcelona, Spain and fallen in love with Antoni Gaudi&apos;s sensibility. I was fascinated with how his buildings appear to emanate from the ground in an organic fashion. I wanted my home to have a similar vibe as it is such an anomaly for the flats of Beverly Hills. I designed the home with barely a right angle in it, as I&apos;m told that this is a sign of good Feng Shui. There&apos;s also a nice mix of water and fire elements, which supposedly contributes to good chi, but the funky shapes of the doorways and entryways were most certainly influenced by the Gaudi structures I saw in Spain, and not by a Feng Shui master. While Libow&apos;s home is not open to the public (though he says it&apos;s a regularly requested stop on Starline&apos;s drive-by celebrity homes tours), he has allowed some camera crews to record video of his unique digs. One of the most recent ones was a live Facebook video with ABC 7&apos;s "Eye on L.A." recorded earlier this month, which can be watch here. 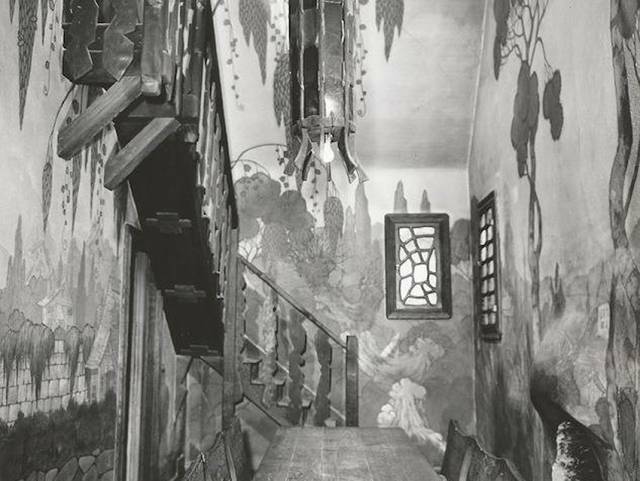 In the clip, he points to the broken tiles arranged into ornate mosaics forming trees along the bathroom walls, hand-carved wood detailing, curved fireplaces that seem to grow organically out of the walls, and even silicon-dipped light bulbs on chandeliers that add to its dark fairy-tale look. The ceilings are finished with cedar grape stakes and the antique tiles on the floor are imported from France. Libow&apos;s also decorated his rooms with unique furniture like a Sweeny Todd-esque barber chair, an authentic wooden cranberry scooper, and fully restored Chickering piano from 1890. "I&apos;ve probably expended more funds on restoration than I would have to build new, but how often do you get to restore a witch&apos;s house? Not that often," Libow told Eye On L.A. The below video of Libow&apos;s home can you a better idea of just how much construction went through the home. Libow was even partly responsible for getting the home listed on Beverly Hill&apos;s local register of historic properties in 2013, meaning the house can&apos;t be torn down. It&apos;s not just the way the house looks that makes it so fascinating; it&apos;s the history as well. 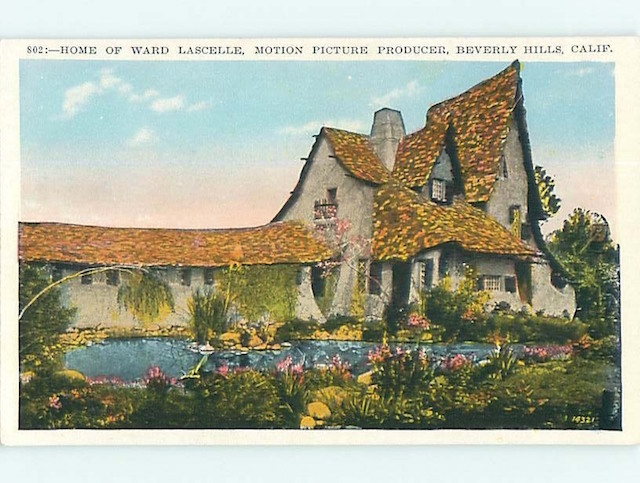 The cottage was first constructed in 1920 for Willat Productions by the silent film studio&apos;s art director Harry Oliver (who also designed Los Feliz&apos;s Tam O&apos;Shanter storybook restaurant). It served the cost-cutting purpose of not only being a studio office, but also a dressing room and film set. The Witch&apos;s House was first situated at 6509 Washington Blvd. in Culver City. As out of place it now is in Beverly Hills, it apparently had the same effect in Culver City. According to the Culver City Historical Society, "There were articles in the newspapers of the time that said the Willat Studio caused traffic accidents!" 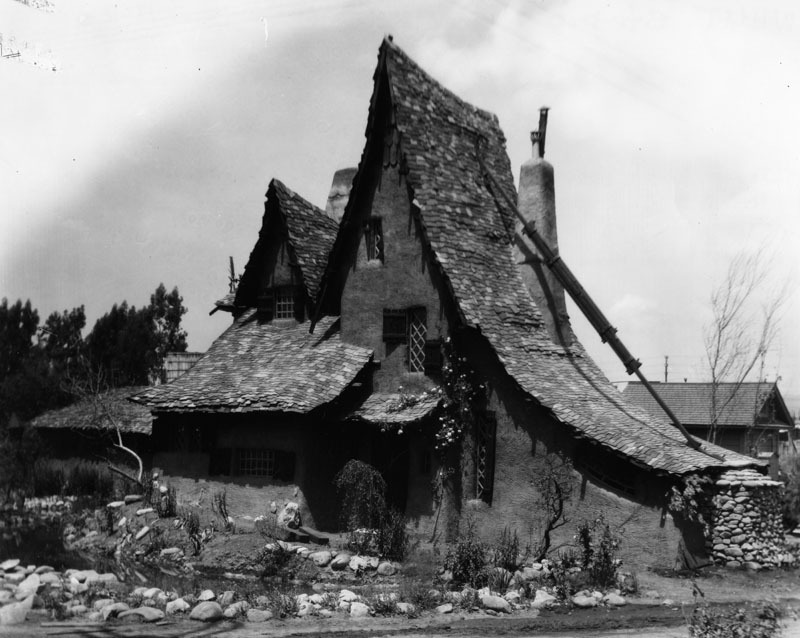 Oliver designed the Witch&apos;s House in the storybook style, an fairy tale-like architectural design that grew in Los Angeles during the 1920s to 1930s. Trudi Sandmeier, who previously worked at the Los Angeles Conservancy, a historic preservation organization, told the Los Angeles Times that this style was most popular in our city, more so than any other place in the country. "Storybook houses are an outgrowth of the blurred line of fantasy and reality that is particular to Los Angeles," she said. The Witch&apos;s House just isn&apos;t any old storybook home. Kimberly Reiss, president of the historical foundation Beverly Hills Heritage, told CNN, "The thing that makes this property important is it set the bar for storybook architecture in Los Angeles during the &apos;20s and &apos;30s." She added that the cottage is believed to have made its first on-screen appearance in the 1921 silent film The Face of the World. 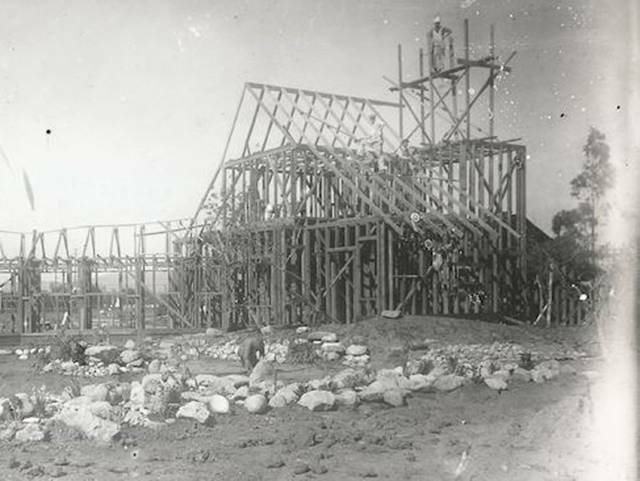 The brothers who owned Willat Productions eventually closed the studio down with plans to demolish the Witch&apos;s House, but film producer Ward Lascelle wanted to purchase it to use as his own private residence. He moved the property from Culver City to its current location on the corner of Walden Drive and Carmelita Avenue in Beverly Hills. There are differing historical references about when it exactly moved to Beverly Hills, but the earliest building permits to the home date back to 1924, when a new two-car garage was installed in the back of the house. According to a landmark assessment and evaluation report on the Witch&apos;s House, the Lascelles began renting part of their home to a musician named Louis Spadena in the 1930s. The Lascelles divorced in 1938 and ex-wife Lillian Lascelle got to keep the house. She and Spadena ended up getting married in the late 1940s (hence the "Spadena House" name) and would continue to live there until they sold it to Martin and Doris Green in 1965. Libow would later buy the house in 1998. 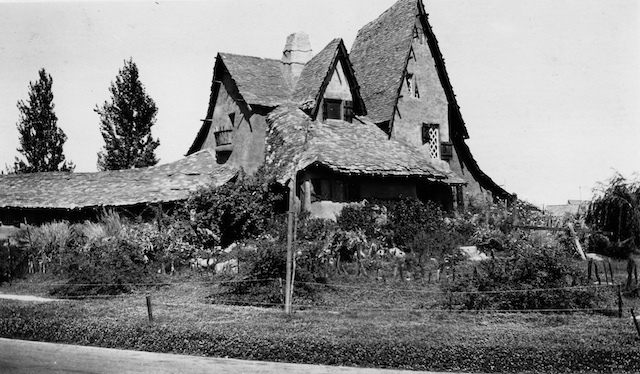 Phil Savenick, president of the Beverly Hills Historical Society, told LAist that the Witch&apos;s House "was a tourist attraction from the moment it arrived" in the 1920s. Back in the day, you could buy postcards with images of celebrity homes—from Jack Benny to Mary Pickford. And even though no celebrity lived in the Witch&apos;s Home, its image was also emblazoned across one of these postcards, which you can see below. Obviously, the home was a major attraction every October 31. 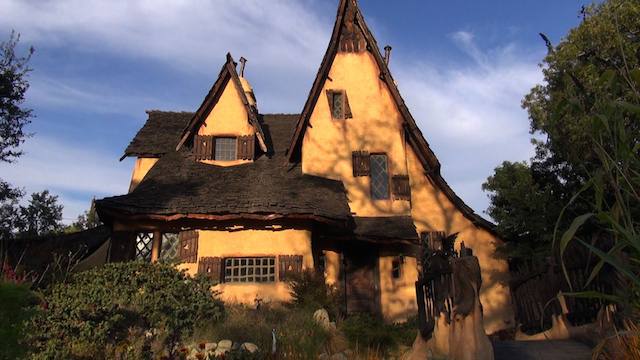 "The greatest memory of the Witch&apos;s House is that&apos;s where all the kids would convene on Halloween, so sometimes they&apos;d get 3,000 to 5,000 kids in front of the Witch&apos;s House, looking for candy and some of them looking for mischief," said Savenick, who first moved to Beverly Hills with his family when he was 6. "That was the corner where the police would always go looking for kids who had eggs in their pockets or whatever nonsense they would do on Halloween, so it came to represent Beverly Hills at Halloween." 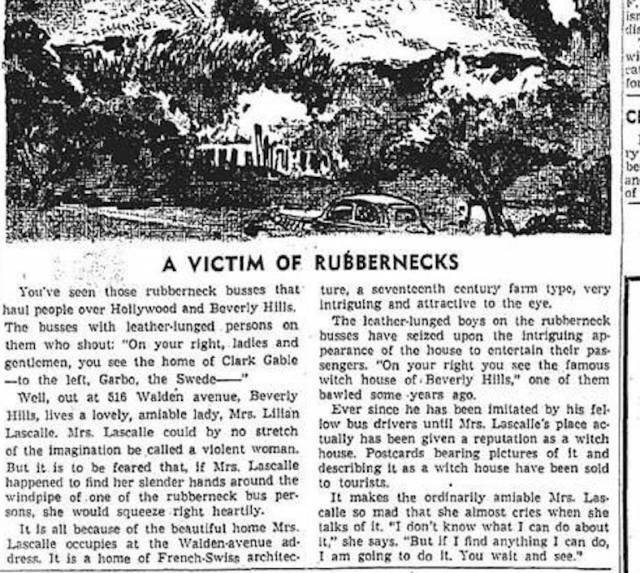 Savenick, who&apos;s now 64, said he&apos;s seen a Beverly Hills newspaper story dating as far back as the 1930s that talked about the "Halloween hooliganism by the teenagers" at the house, so it&apos;s been a gathering spot for nearly a century. Libow is still keeping the tradition alive, and told ABC 7 that he passes out the "good candy" to around 4,000 trick-or-treaters during a four-hour span during the spooky holiday. Savenick sees the Witch&apos;s House as something special. "There&apos;s old Beverly [Hills] and there&apos;s new Beverly [Hills]," he said. "It represents old Beverly to me, when there was room around houses, when houses had character, when we were a neighborhood. New Beverly is now going to be high rises and condos and congestion and these giant mini-mansions that have no style and have no real architectural heritage to leave the community. . . .To me, [the Witch&apos;s House] is the last vestige of a bygone time. We don&apos;t have many houses from the &apos;20s, maybe a couple dozen, but there really aren&apos;t that many."